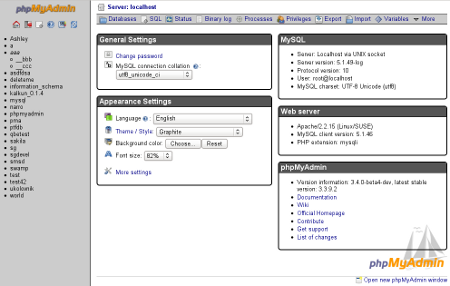 Today, I've made available two new themes for phpMyAdmin on our demo server. And we're still waiting for more contributions to our Theme contest. PS: Forgot to mention that new themes are only for 3.4 branch and won't work with others. Published on Feb. 7, 2011, 4:37 p.m.
As my Gammu Hackweek 6 project went smoothly, I've decided to spend some time today on phpMyAdmin as well. My work was mostly inspired by (IMHO unfair) comparing of Adminer and phpMyAdmin. I could surely create similar comparing where would be dozens of things why is phpMyAdmin better, but I don't want to go that way and I rather decided to spend my time on coding. First and easy task was bit which is in comparing described as "Status variables", where I've added documentation links, so phpMyAdmin now has both short executive summary and link to the official documentation. While looking at server status page, I've categorized some newly added variables, so they now appear in right place. I also reconsidered formatting of numbers and hopefully current solution will work for everybody and not produce contradicting bug reports like the old one. Then I did focus a little bit on testing AJAX and fixed some minor issues, mostly affecting Chrome/Chromium browsers, because they are strict in case of some errors. Last but not least I've added URL redirector inside phpMyAdmin, so no external links will now reveal what did user actually was doing in phpMyAdmin, but rather the url of the redirector. And when speaking about phpMyAdmin, I need to mention one thing as well: contribute yourself! You don't have to be developer, there is currently ongoing themes contest and we're always looking for translators. Published on Jan. 28, 2011, 8 p.m.
All code is is available in our Git repository and check documentation for information how to set it up. There will be testing release incorporating these changes next week to give broader audience chance to test it. Yes, getting basic information already works for the developer working on it :-). Published on Jan. 28, 2011, 4:54 p.m. I've (again) changed schedule of what to implement and I've spend fourth Hackweek 6 day by doing more cleanup and documentation work than real coding. The major new feature is support for direct installation of the applet to the phone, so the installation is now easier. There were minor improvements on the both sides to allow support for calls and deleting of SMS messages. Adding calendar and todo entries is still left for future (hopefully tomorrow). I've done (more or less) final cleanup of my changes in the applet itself and I've sent changes back upstream hoping for merging them (I'd give you link to the mail, but the archive does not work). Rest of the time was spent collecting feedback from users testing the code (surprisingly there are already few brave users who gave it a try). It resulted in few bug fixes and improved documentation. Last but not least - all code is is available in our Git repository and check documentation for information how to set it up. Published on Jan. 27, 2011, 4:51 p.m.
Third Hackweek 6 day went a bit differently than I planned, but there is still lot of progress. I've added some more calls to the Series60 remote protocol, so that some things now work much faster (eg. getting number of contacts, calendar entries). The applet now also has a function to toggle Bluetooth so it does not have to be done elsewhere in phone menus. On Gammu side I focused on messaging support, so now Gammu can list messages in the phone or send new message. Modification of calendar entries is left for tomorrow, hopefully I will get to it and the support will be more or less complete and I will have Friday for final cleanup. And as usual - all code is is available in our Git repository and check documentation for information how to set it up. Published on Jan. 26, 2011, 4:09 p.m. I've spent second day of Hackweek 6 on more different tasks. On the Gammu side, I've implemented reading of contacts and todos. No write support yet, that will be done tomorrow. And of course counterpart for the screenshot function. I've also spent some time on writing documentation, so now there is some documentation on setting up the S60 connection or the new gammu screenshot command. All code is is available in our Git repository. Published on Jan. 25, 2011, 5:13 p.m.
Email address 1      : "gammu-users@lists.sourceforge.net"
Tomorrow I should be able to implement calendar, let's see how will it go. Published on Jan. 24, 2011, 3:27 p.m.
Last year I did not have much time to spend on non work related projects in Hackweek, because we took the opportunity and replaced some internal systems, when people were not using them. It will be different this year and I've decided to spend some time on Gammu. The plan is to implement support for Symbian phones. It is one of frequently requested features and thanks to Series60-remote I can as well see way how to implement it. Current plan is to add support for their applet, with possible extending it in future and adding some features which it lacks. You can comment this feature in openFATE or Gammu bug tracker. PS: Introduction video can be found on blip.tv. Published on Jan. 21, 2011, 8:43 a.m.